India’s population density has a severe impact on its environment and they continue to struggle to minimize the effects. As a responsible travel company we certainly do not want to add to the problem. We begin at home, operating with responsible tourism values since our inception. From an environmental perspective, our initiatives extend from our company offices to our tours. Our head office and stores are powered by a local green energy provider, we encourage cleaner transportation methods for staff, and we purchase all supplies from a local green business supplier. Low Impact Transportation: Our rail trips allow our travelers to see the most of India while being better for the environment. Using public transport is the most sustainable way to go – after walking and cycling of course! Traveling in India is all about community. With its dense population and its abundance of cultural sites you can’t help but be immersed in it every day. On this trip, in Kalimpong, you’ll learn how to cook some delicious local cuisine and then enjoy it with a family. 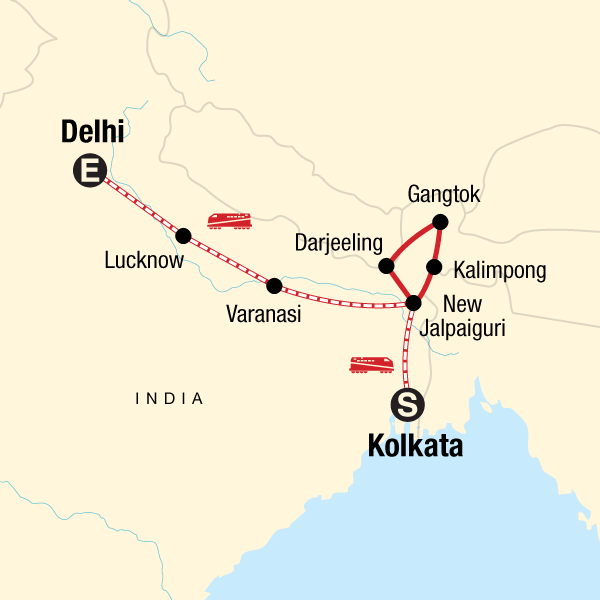 You’ll also visit a few World Heritage Sites such as the Agra Fort, the Taj Mahal, and the wonderful toy train on the Darjeeling Railway. If you choose to extend your stay in Delhi a few more sites can be added to your list: Humayun’s Tomb, the Qutb Minar and its Monuments and the Red Fort Complex. Many world heritage sites are designated for protection so that all people may share in these fascinating and historical wonders for generations to come.